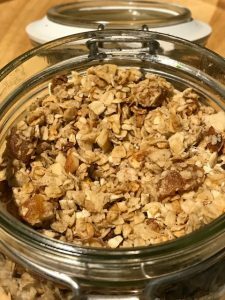 Nutty Granola – a lower sugar version. 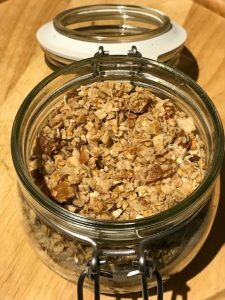 My children love granola as a topping for their yoghurt, but often the shop bought versions are super sweet and the lower sugar options are pricey. In my mind making my own sounded like a faff, hence it’s not something I’ve investigated… until I started making a new flapjack recipe and didn’t get the consistency quite right. You know when you know it isn’t right but you keep going regardless. Silly me. As an experienced flapjack maker (and eater) I should have know better. Flapjack intuition. So when Miss K tried to pick up and eat said flapjack and it crumbled to smithereens we needed a quick rescue as I’m not one to throw away food. Turns out it makes an amazing granola. Sweet enough but not super sweet. I’ve worked out the nutritional info as about a 30g serving. 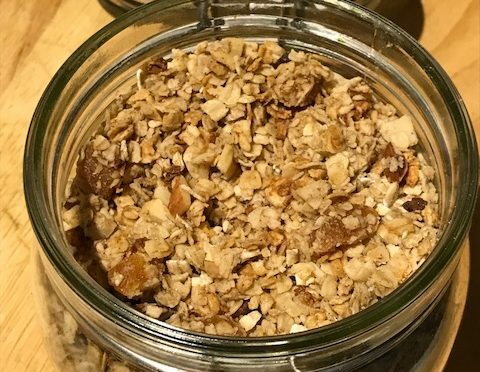 Nutty Granola, a lower sugar version. Heat the honey, margarine and peanut butter (I used the microwave) until it is melted. Mix in the oats, nuts and sunflower seeds. Press into the tin and bake at Gas Mark 4 for 20 minutes. Stir and break it up, bake for another 5 minutes. Cool and store in an airtight container such as a kilner jar. This is one of those foods to watch your portions and to eat with enjoyment. I’m a huge believer in having some sweetness if you fancy and not depriving yourself. I’m trying to model this and teach the children. My boy has a sweet tooth so this granola enables him to have the sweetness but also get a good balance of nutrition in.